On St. Patrick’s Day afternoon, while scores of revelers wearing green top hats and shamrocks were passing by, Judy Stepenaskie and I were in front of St. John the Baptist Church in Manayunk, the church famous for, among other things, its large stone steeple being the home of nesting peregrine falcons for the last nine years. Peregrines are amazing creatures — the fastest animal on the planet, capable of diving at speeds above 200 miles per hour while chasing their prey, other birds like ducks or pigeons. 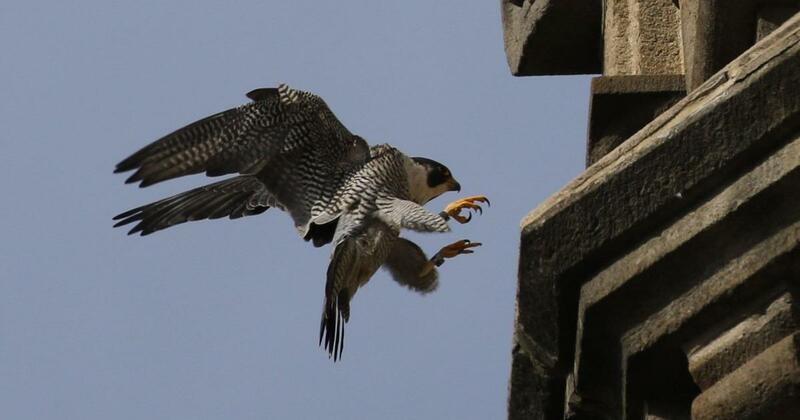 It’s appropriate they nest on a church steeple, as these are Lazarus birds, true miracles, brought back from the dead: the northeastern subspecies of peregrine is actually extinct, a victim of DDT poisoning in the 1960s. The birds nesting in Manayunk — and on the Delaware and Schuylkill bridges — are all descendants of a wildly successful 1970s captive breeding program, bringing other subspecies together, mating them and placing their young in the wild. 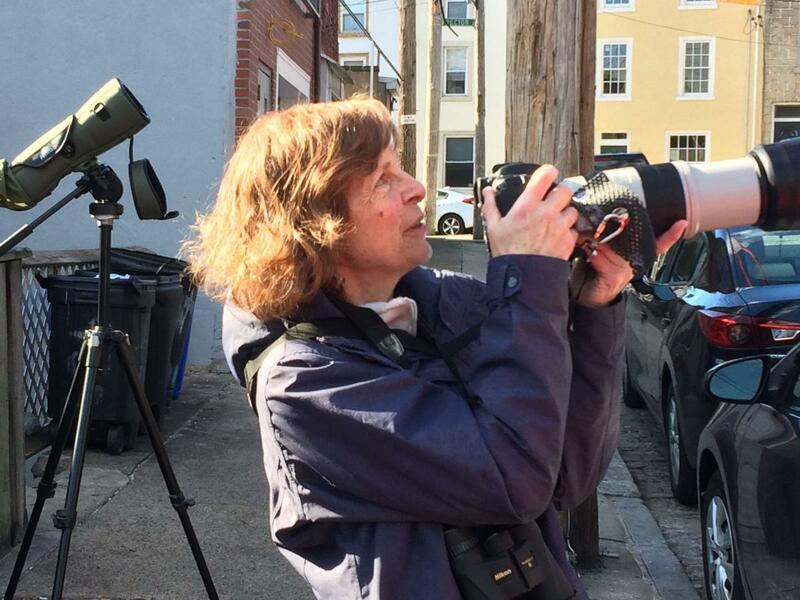 And Roxborough’s Judy, a retired OSHA scientist living on Nixon Street, visits the peregrines frequently — twice last Sunday, in fact — to photograph and record their doings. The Sunday before, she saw them mating — atop a finial just under the golden cross. 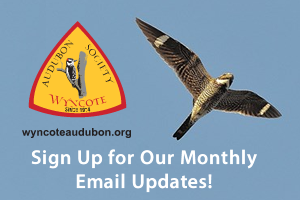 This week, she had not seen the female — she dubs the pair “Manny” and “Yunker” — for a few days and thinks Yunker must be incubating eggs in the nest box the state’s wildlife experts placed inside the highest south-facing window. As Judy was setting up her spotting scope, we heard a loud squawking above us, the male’s return to the nest inducing an excited exchange between the two. Manny flew inside to take a turn incubating eggs, and Yunker flew out, made a quick mid-air turn and came back to sit atop one of the finials. She sat in the sun, preening, for a very long time, Judy and I taking turns looking at her through the scope, Judy also photographing her. When I peeked at her, she turned her head in my direction, and the yellow spots around her eyes were absolutely breathtaking. Also the prior Sunday, Judy saw a pair of bald eagles fly over the steeple — having eagles in Manayunk is also a miracle — and Manny raced out toward them, squawking to chase them off; she also saw him chase away a turkey vulture carelessly soaring nearby. And one year, another male came to Yunker, attempted to mate as Manny was away — the nerve! As she batted the newcomer away, Manny swooped in to chase the cad. She’s seen the female give one of its fledglings, sitting on the wires, a bird to eat, but the clumsy youngster dropped the food. Yunker swooped down, grabbed the morsel in mid-air and returned it to the kid. “That was pretty amazing,” she told me. Allow me to offer perhaps another similarity between Judy and the peregrines. The birds nest in the south-facing steeple window, one that offers two important advantages: a view of the river and its ducks, one of their prime food sources, and the warming southern sun-lit exposure. Judy’s home on Nixon Street likewise provides a similar view of the same river — they both love watching for ducks on the Schuylkill. Peregrines nest for life — or until another male or another female upstages one of the pair. 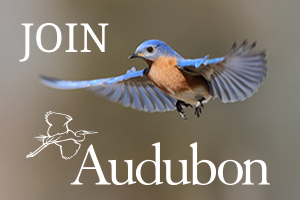 Last year, one of the newly mature females from this nest ended up in Baltimore, there chasing off an older female on an established nest there — she just took it over — and the male there accepted her. Another successful offspring from this nest recently set up shop in the Meadowlands, sadly becoming a Giants fan. Meanwhile, Judy will visit every day to catalog the pair’s doings until they leave in June, Manny and Yunker returning to solitary lives. The young stay behind at the steeple and one by one decide to strike out into the world, the last usually gone by July 4, Independence Day, appropriately. “I always feel sad when that happens,” she noted. But for now, the peregrines have a falcon godmother, keeping her vigil to make sure the peregrines thrive. Make sure you stop by the steeple and have a peek through her scope, too. The birds are simply stunning.